As part of its on-going campaign to raise awareness of the war in Syria and currently in particular the starvation sieges, ISSM is organising meetings and video link-ups between Irish state officials and politicians and experts on Syria. The most recent of these took place on 28th June with Dr. Roger Hearn, former director of UNRWA (United Nations Relief and Works Agency), former Regional Director for the Middle East and Eurasia with Save the Children, and prior to that with Care International, and is transcribed below. A previous video link-up meeting was held on 12th May between Haid Haid, a Syrian independent activist and political analyst based in Lebanon, and officials of the Irish Dept. of Foreign Affairs and Trade. ISSM would like to take this opportunity to express its sincere thanks to both Dr. Hearn and Mr. Haid for their participation and their continued contribution to the cause of peace and justice in Syria. Dr. Hearn was Regional Director for the Middle East and Eurasia with Save the Children, and prior to that with Care International. He is currently lecturing in disaster management in Copenhagen. The meeting was hosted by independent T.D. (M.P.) Maureen O’Sullivan. Senators Alice Mary Higgins and David Norris sent apologies and requested updates on the meeting. Minister for Children Katherine Zappone also sent apologies. Also in attendance was Simon Murtagh of AWEPA -The Association of European Parliamentarians with Africa. He suggested to Deputy O’Sullivan after the meeting that they might raise Dr Hearn’s points at a meeting they are attending in the UK the following week. Also attending the meeting from the Irish-Syria Solidarity Movement were Valerie Hughes, Anne Daly, Leonie O’Dowd and Ronan Tynan. The Context: Dr. Hearn witnessed the Arab Spring events and recalled saying -after an event with UNRWA which half the Syrian government attended along with diplomats from the international community -that ‘no way would there be an uprising in Syria -5 days later the uprising started.’ He says he has been consistently wrong in terms of his predictions in what would happen in Syria. He spoke on the theme of delivering humanitarian aid as response to a ‘Human Rights Catastrophe’: ‘Another major theme that really impacted early on was in terms of the way the different UN agencies started navigating their way through the crisis. In August 2011, by this stage it was very clear that there was really a human rights catastrophe going on inside Syria. Peaceful protests took place, followed by very repressive tactics to put down these protests. ‘Unfortunately -and this is where (we see) the whole sort of bad hand that the UN was dealt -because of the divisions in the UN Security Council, largely relating back to mistakes in Libya and the sheer paranoia that came out at the Security Council level -that level of division really meant that we were unable to really call for the things we needed to do. At that point it was about how can we really monitor and address the human rights catastrophe going on in the country. Unfortunately what the UN did was it responded by saying: ‘Let’s send a team from OCHA in Geneva -we’ll come and look at the humanitarian situation in the country.’ I remember early on, soon after the delegation would leave a place like Homs, there’d be shooting: people would have come into the streets wanting to talk about human rights (abuses) and a whole range of other atrocities and they would be met by gunfire soon after the delegation would leave. It’s what we’ve seen really -something never really been fit for purpose in terms of how the UN agencies would work. ‘The sorts of things that different agencies were trying to preserve are I think worth looking at. At that point UNDP was working and wanted to maintain its good governance programme. It wanted to suggest its good governance program in early 2011 had basically pretty much gone on course. Similarly UNICEF was keen to continue working on its own governance issues. 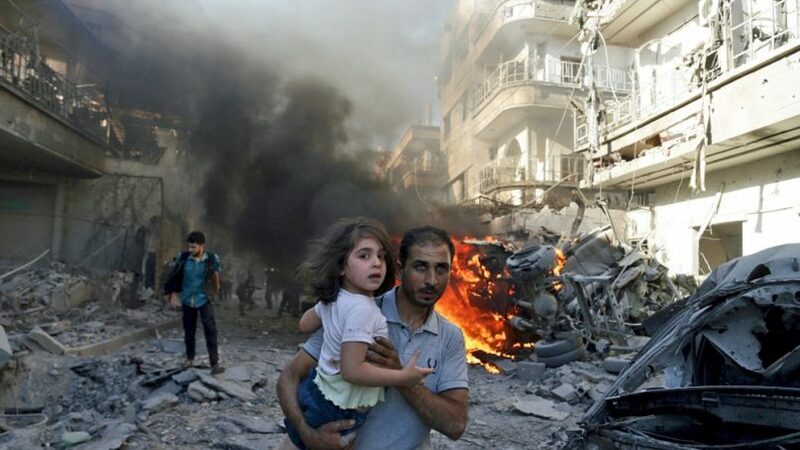 ‘Again with the sorts of abuses and atrocities going on, particularly focused on children, one can suggest that was not a major priority anymore in terms of Syria. What you had were different agencies who wanted to maintain their presence. Roger Hearn: ‘What we have now is a situation where the lion’s share of the humanitarian relief going into Syria passes through Damascus and through the Syrian Arab Red Crescent and a smaller number of registered national institutions, basically vetted by the Syrian government. Of that approx. $3 billion passing through Damascus, you’re really left with a situation where the Syrian government can determine where that aid goes. A small amount of aid is going via cross-border operations but the lion’s share of aid is passing through Damascus. ‘Since (despite) Security Council resolutions where we had clear recommendations by the world body, (to wit): ‘we want to see cross-border, cross-line operations, we want to make sure that people in most need actually receive the aid’ –unfortunately (in practice) individual agencies have continued to refuse to work cross-border, basically because of threats they would receive from the Syrian government. They could continue operations (but only under conditions) largely to be stipulated by the Syrian government. ‘As an example of that: you can have sieges in one area (sieges by and large are constructed by the Syrian government) and in the next area, an area supporting the Syrian government, they could be getting consistent and ongoing aid flows. The answer to that is we just have to be very conscious about what we are doing in relation to Syria. We might as an international humanitarian community conclude that the most appropriate way to reach those most in need is to continue our operations at all costs through Damascus. Brid Smith TD: ‘I just want to ask you about how we got here. Because you said earlier on that different agencies wanted to negotiate their presence separately and maintain their presence separately and you didn’t want to make any suggestions as to why they wanted to behave like this to maintain their presence separately like this. And I want to ask you could you explain that a bit better and really just to ask you what makes Syria different to any other conflict? Is this not a situation you would have seen in other conflicted regions or is there some dynamic that makes it different in Syria? Roger Hearn: ‘What’s happening is that you are seeing people most in need often missing out on humanitarian relief. I’ve made compromises in this business for many years as well. You’re forced to make compromises. There’s no such thing as purity when it comes to a humanitarian operation. But when you’ve lost sight of potentially 95% of what you do because you’re simply not given permission by the government of Syria to actually block the aid which Syrian proxies are taking, I think this is an incredibly dangerous step and I think the consequences of that is that people probably most in need and people not living in government areas are the ones missing out. Maureen O Sullivan then finished up the meeting by expressing the hope that in the future there might be a face to face meeting in the event of Dr. Hearn coming to Ireland. Please join & share this website!